Let’s face it, whether you prefer in ground or above ground, having a swimming pool in your backyard is one of the best ways to have fun outdoors while beating the summer heat. And what’s even better? Being able to swim long past the hottest months of the year, thanks to a pool heater. If you want to extend your swimming season, you’ll have some considerations to make, depending on the type of pool you have, and especially if you’d like to heat it using a solar heating solution. In order to heat your swimming pool throughout the year, you have three different options. The first, and likely the most affordable up front, is a gas-powered hot water heater. This solution burns gas to heat your water as it’s pumped through the system and back into the pool. The next option is an electric heat pump that extracts heat from the air and uses it to warm your pool water. The final option is a solar heating system that warms itself from direct sunlight and transfers that heat to your pool. Each option works well, but the gasoline and electric heat pump will both cost you much more money over time than the solar heating solution will, because a solar solution generates all its heat passively from direct sunlight. The main difference between an above-ground pool and an in-ground pool is that the above-ground pool loses heat at a much greater rate. That’s because heat escapes through the sides, as well as the top. An in-ground pool loses heat out the top, and also through the sides, but since the sides are surrounded by insulating dirt, the heat escapes at a much slower rate than it does in an above-ground pool. This means if you have an above-ground pool and an in-ground pool of the same size in the same climate, the above-ground pool requires a much more powerful heater to raise its temperature than an in-ground pool does. If you decide that you want to use a solar water heater, the type of pool you have isn’t going to alter the type of heater that you need. Every solar heater will move the water from your pool through the collector array that heats it up and sends it back to the pool once again. The only change that needs to be made is the size of the system. You’ll need a larger system for your above-ground pool, and that means that you’ll need more space and you’ll spend more up-front in materials and labor to have everything installed. If you plan on heating your above-ground pool, it’s a good idea to consider insulating it first and foremost—especially if you’ll be using anything other than solar heating. While solar heating is free, gas or electric heaters—after all the installation and material costs up front—will cost you on a continual basis. There are, however, insulation products that can be installed underneath the waterproof liner of an above-ground swimming pool. These retain the precious heat that’s being lost so readily, and they are an important step for increasing the temperature of your above-ground pool throughout the year. Solar pool heaters work best when their collectors are installed on a roof. Not only is the sun access usually better, but the collectors are out of the way and not taking up precious yard space. Whether you have an above-ground or in-ground pool, it’s important to consider if you have enough roof space for your solar heating needs. You’ll need to dedicate a large amount of space to heat either pool type, but with an above-ground pool, you’ll likely need around twice as much space for your heating array. This might mean that you have to rely on backup heat sources to get your pool to the desired temperature, or that you’ll have to rely on more efficient solar collectors to do the job. There are three different solar collector options for heating your pool—flat plate collectors, evacuated tube collectors, and batch collectors. Flat plate collectors generally take up the most roof space, but they generate a good amount of heat without the need for added water storage, as is the need of the other two options. Batch collectors hold a large amount of water that’s heated over time and returned to the pool—these collectors can heat water to uncomfortably hot levels over time, and they tend to be less efficient than the other two heating methods. Evacuated tube collectors are the most efficient option available. They rely on vacuum tubes to generate heat, and can produce more heat in less rooftop space than flat plate collectors can, offering added heat for pools with large heating needs. 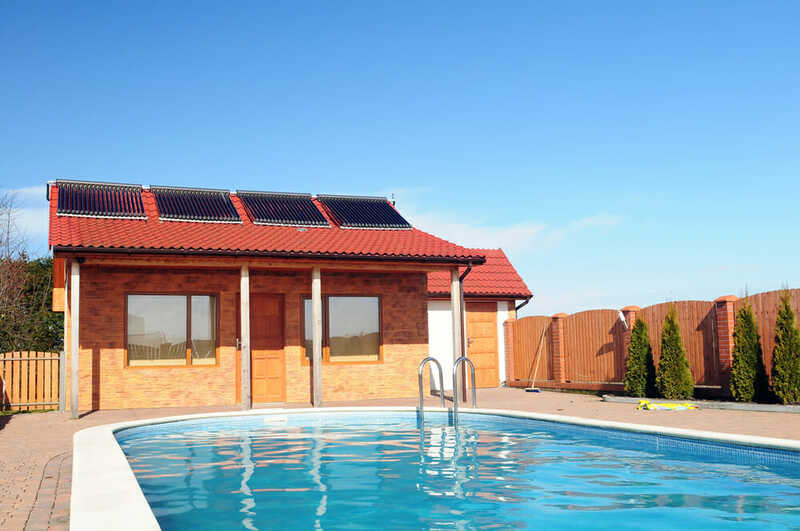 Before you even decide to get a pool heater, it makes more sense to put a solar cover over the top of your swimming pool if you aren’t using one. 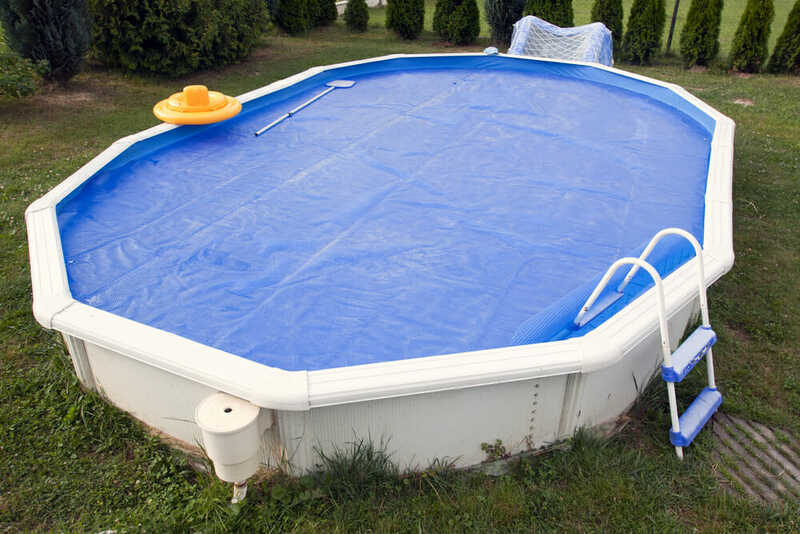 These affordable covers are very effective at retaining heat to raise your pool temperature, and they work well with both in-ground and above-ground swimming pools. Although the covers can be easily removed, it’s a good idea to keep them on anytime the pool isn’t being used, as long as you want to increase the temperature. Not only will the cover help increase temperature and conserve heat, but it will also reduce evaporation and help retain your water throughout the season to keep water bills or pressure on your well system down. Most solar heaters aren’t going to provide you with all the heat you need if you live in a cooler climate and you plan on using your pool all throughout the seasons. If that’s the case, you’ll need to consider a backup heat source as well. There are two common types of pool heaters available as backup heaters—a heat pump, and a gas-powered heater. The heat pump system relies on electricity and is more efficient than a gas-powered unit. A gas-powered unit is more affordable initially and will heat the water quickly, but will do so at a higher cost to you. If you will need the backup heat quite frequently, a heat pump is the more affordable option, but if you only need occasional heat a few times during the season, the gas option is likely to be the more affordable way to go, even when you factor in the long-term costs. Whether you have an above-ground swimming pool or an in-ground pool, you can heat your water to a comfortable temperature. You’ll just have to consider the size of your solar heating system carefully, and whether you want a backup gas or heat pump system to keep your pool as warm as possible.